Welcome to Modern Keys Living with Bay Views! Visit the area where Bloodline was filmed. Catch glimpses of our area and the condo complex on the show. New from top to bottom!!! 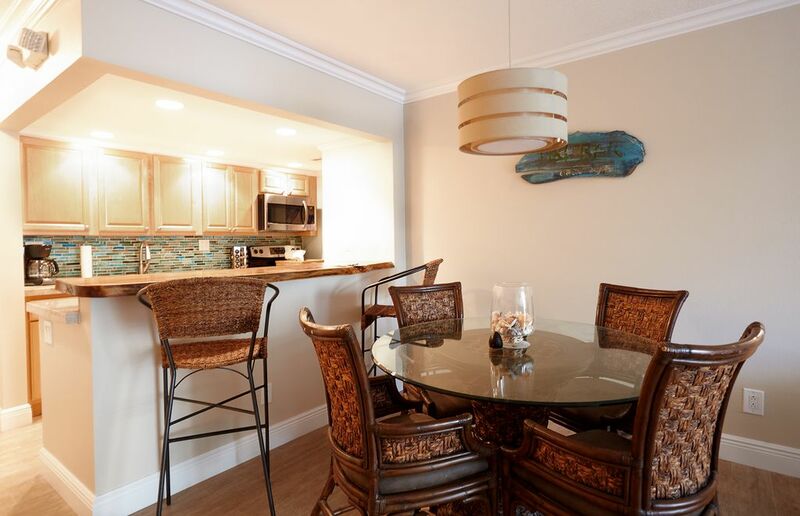 Newly remodeled and beautifully decorated 1st floor corner unit with a private entrance. Enjoy the mix of vintage and new furniture and the most comfortable sofas, beds, linens and more! This home is equipped with everything you need, truly a home away from home! A fully stocked kitchen with all the conveniences are all included! Nestled in the corner of Summer Seas and the beautiful Florida Bay , this location is serene, peaceful and picturesque! The 2 bedroom, 1.5 baths, sleeps 6 comfortably in beds (1 king, 1 queen and 1 queen sleeper sofa) with beautiful water views. Every detail was considered when renovating to make your Keys vacation a lasting memory. Indoor living includes custom driftwood breakfast bar, dining table from Bali, sectional couch and coffee table. Finishes include gorgeous ceilings moldings, customs window treatments, hurricane proof windows, shades, hardwood porcelain tile floors, granite counter tops and air conditioning. For your entertainment enjoyment, the living room has a 42” Sony hd led tv. Watch for our friendly manatees from the bedroom windows or along the dock, just steps from the unit. You will see why we affectionately call this, Manatee Bay. We are only steps to the blue green water! Two master bedrooms, both with bay views. Great for two couples or a family with children. Take advantage of great snorkeling and diving along with fishing the world famous Islamorada waters. We are only minutes from one of a kind Florida Keys attractions, restaurants, night life, as well as shopping, water-sports, boat charters, and rentals. The condominium offers two pools, one of which is a wading pool. There is a game room with billiard tables, plus a children's playroom. We have an exercise room right off the swimming pool area. Our marina is teeming with sea life! Even manatees swim through to check us out. Sit on the sand at our beach area to watch the fantastic sunsets. You may even see a dolphin or two! Bedroom one - Enjoy the wonderful bay view from your Sealy Pillowtop Luxury King sized bed! Bedroom two- Enjoy the wonderful bay view from your Sealy Pillowtop luxury comfy queen sized bed! En-suite half bath. Living room has queen sized sleeper sofa. Balcony has only partial view of the marina and bay. Call us if you have any questions. NO BOATS, TRAILERS or JET SKI's allowed on the property. Dock-age of boats in our marina and use of the boat ramp, is for owners only due to insurance reasons. $300 reservation/damage deposit due at the time of the reservation. Balance, including remainder of rent, and $100 cleaning fee, due at least sixty days before arrival. Damage deposit will be returned within 30 days of departure if no damage. Upon receipt of deposit, an e-mailed confirmation rental agreement showing receipt of money will be sent. Upon receipt of balance, condo information and keys will be sent. Hurricane refund policy: if a hurricane warning for Islamorada is issued during a stay and the renter must leave, we will send within thirty days a prorated refund determined by number of remaining nights in the stay minus cleaning fee. If just prior to arrival a hurricane warning for Islamorada is issued, we will send a full refund within thirty days. No boats, trailers or jet ski's. Our family purchased our first condo in 2001. We loved it so much, we bought a second in 2002, and this is our newest property bought in 2013. We hope you enjoy this tropical paradise as much as we do! We have just completed our renovation of this newest unit in December of 2015. The keys have it all! This unit is the best location in the building. Private entrance,first floor corner unit with bay views from bedrooms and bathrooms. Our great location means that you are minutes away from world class diving, snorkeling and fishing! Enjoy fabulous waterfront dining and casual beach bars! Full shower. No tub. Newly remodeled. Views from bedrooms and bathroom. partial View from Balcony. Bayfront, just steps to the water. beach is just a few hundred feet away. Coin operated on floors 2, 3 and 4. Bring quarters. 1 pod of detergent is provided at check in. Great parking just outside the unit. ^6 bath towels and 6 beach towels. They are replaced regularly throughout the year. Available to guests. Located by the pool. Key is hanging by the door just inside the unit. Private wifi in the unit. A back up is provided in the lobby. Mr. Coffee drip coffee maker. Breakfast Bar with additional seating for two at breakfast bar..
Great patio. Sip your coffee outside and watch for manatees. Peek a boo view only from balcony. Cable, 3 TVs, Workout Room, Game Rooms, Pools (shared), Security Gate, Sorry, NO Smoking & NO Pets, and no boats, jet skis or trailers. From the time we first contacted the owners it was first class. When we arrived it was even better than we thought it would be. So close to everything. The property was awesome. They have a little Marina, Grills, and a spectacular spot to view the Sunsets!! I would highly recommend this property and we can't wait to stay here again!! Thank you for a wonderful getaway!! Just like always the unit was a great place to stay. Everything needed was there. The convenient patio entrance is great for getting to the pool. It’s a very comfortable, clean, well stocked unit. Thanks Annie for a great week! Absolutely loved our time at Manatee Bay. My wife and I stayed at Manatee Bay from 11/11-11/18. We are very particular about where we stay and found this place to be awesome. The Condo was exactly as described and even better. The master bed was very comfortable. We didn’t use the other bedroom. All cooking utensils and supplies were available. Even had numerous spices on hand for those that are cooking and eating in, which we did. We ate out a few times and loved Mile Marker 88. We didn’t get an opportunity to take the Kayaks out because of my recent surgery but will take advantage of them next time. The grill area was close to the Condo and was well lit. All of the people we met at the Condo were very friendly. The pool was very well maintained and had newer furniture. Several beach towels were provided, which is helpful for those flying in and limited to the items you can bring. We felt like we were at home. Thank you for sharing your little piece of paradise. We look forward to returning soon!!! Great spot in the Keys! Second time we have stayed at Annie’s place in the Keys and we will definitely be back! This unit is conveniently located for access to the pool and beach. It has been nicely updated and is very comfortable. Annie kept in touch before and after to make sure everything was going smoothly. Highly recommend! We were very pleased with our stay at the condo. The condo was very nice and accommodating for our family. The pool was so pleasant and we thoroughly enjoyed the sunsets on the beach. Nice accommodation although we did get the impression on line that it was closer to the pool than it was. Could do with having the unit number on the outside if property as it wasn't obvious which unit was ours and you have to got up to the back porch to reach key box so a number on the back would be better, also we had no dining lights or breakfast bar lights for the whole of our stay. No boats or trailers on the property. Fines will be imposed by the condominium association. Resort Fee is for use of the pool, beach area and condo association wi-fi.